The great sprawling mass that is America’s second largest city is developing a downtown, and this year there are several cranes on the skyline and more construction than I can ever remember. Once a ‘no man’s land’, Downtown LA has become one of my favourite places to visit in California. It’s fascinating to watch a fine city evolve. On Spring Street musicians, artists and gallerists are hanging on by their fingernails as developers move in. LA’s Gallery District is rather short on galleries these days. Also, I was told, Skid Row is expanding as more of the homeless find themselves on the streets. But overall, things seem to be looking up. Anyone who’s seen television’s “DRAGNET” is familiar with the monolithic LOS ANGELES City Hall. It broods over Downtown L.A. (DTLA) – which only a decade ago was a rundown neighbourhood of urban decay. That’s rapidly changing. Los Angeles’ core is reawakening, thanks to business and civic leaders, an influx of young residents, artists, restaurateurs, philanthropists, landscapers, developers and renovators. Downtown Los Angeles has a vast array of 1920’s, 30’s and 40’s architecture – the largest in North America. In the last couple of years, a majority of these buildings have undergone renovation, much to the dismay of movie companies. There’s an Arts District now, at least two new parks (Spring Street and Broadway), reborn monumental theatres, owner-operated coffee bars, trendy restaurants, a fancy wine shop – and even a couple of bike paths. Combine all this with the Walt Disney Concert Hall, the Dorothy Chandler Music Pavilion, the Bradbury Building, Central Market, Museum of Contemporary Art, the upcoming Broad Museum, Japan Town and a subway – and you’ve got the makings of a vibrant city core. To quote GERTRUDE STEIN, there’s now a “there there”. LOS ANGELES is a big city filled with big attractions and more than its share of big people doing big things. But for me – the little things matter more. Here are three of my favourites. 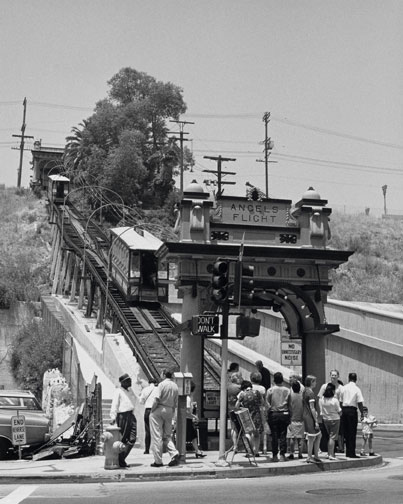 ANGEL’S FLIGHT <PHOTO OPPOSITE, 1969, by photographer JULIUS SHULMAN> is an electric cable railway which runs from Downtown LA to the top of Bunker Hill. The ride takes about 2 minutes and costs 50 cents each way. If you like, climb up the Hill via a stairway of 123 steps and 10 ramps. During the Great Depression, Bunker Hill was home to many poor families who lived in once-elegant Victorian mansions – then degenerated into boarding houses – overlooking the city. Today, it’s the Financial District. MILLARD SHEETS, a California painter, was fascinated by the Bunker Hill neighbourhood. Two of his paintings, ‘Angel’s Flight, 1931’, and ‘Tenement Flats, 1933-34’ are shown below. Another little attraction in LA is located at 709 LaBrea Boulevard. This is PINK’S HOT DOG STAND, founded by Paul Pink. It began as a hot dog wagon in 1939, was upgraded in 1946 – and ever since has drawn lineups of locals and tourists until the wee hours. The world famous HOLLYWOOD SIGN isn’t the original, built for $21,000, and demolished. Today’s steel-lettered sign was erected in 1978. 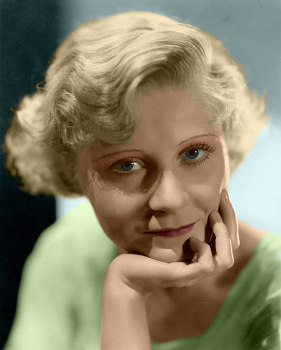 The original had a notorious past, when former Broadway star PEG ENTWHISTLE (photo below), climbed up, and jumped to her death from the letter ‘H’ in 1932.